As evangelists of the mobile messaging industry, Upland Mobile Messaging has a few tips to help newbies just getting started. As evangelists of the mobile messaging industry, we have a few tips at Upland Mobile Messaging to help newbies just getting started. It just takes a bit of know-how to speak competently about a text messaging campaign with the objectives of reaching more people, increasing brand loyalty, and ensuring you are compliant with rules and regulations. The first step is to learn the text messaging lingo. 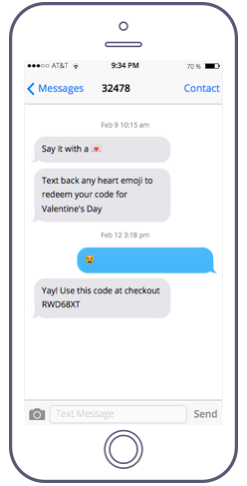 Understanding key terminology is a helpful way to familiarize yourself with some of the most basic and useful features of a text messaging campaign. Stands for short message service, is the standardized communications protocol for mobile devices. In other words, it is shorthand for a text message. People often use SMS and text message interchangeably. Stands for multimedia message service, is the standardized communications protocol for multimedia content. In other words, it refers to any visual media file that you can send to a phone number—such as an animated GIF, picture, or video. A special 5- or 6-digit phone number designated for companies and organizations to send and receive SMS and MMS. Just like you would text with your friends from your own mobile number, companies can text back and forth with consumers from a short code. The word or phrase that people need to type and send to your shortcode number to subscribe to your text messaging campaign. 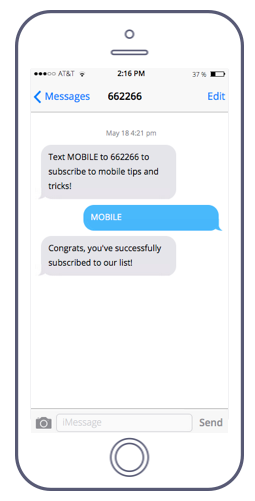 A call to action is any content or material that asks users to text a keyword to your shortcode to opt in to your text messaging campaign—for example, “Text MOBILE to 662266 to subscribe to mobile tips and tricks! This text messaging guide is perfect for beginners to learn the basics of mobile messaging for marketing campaigns. You’ll learn the basics you need to be successful in your text messaging campaigns. The next step in this text messaging guide is to understand why text messaging campaigns are so popular and important. Here are three facts about text messaging that are important for any marketer starting off an SMS campaign. Text messaging is the most widely used communication channel available today. While not everybody uses email or makes phone calls regularly, 90% of the American population texts. This means that text messaging campaigns help you expand your reach to your audience members who will see your call to action. Text messages have significantly higher open and read rates than email or social media. Not only is text messaging more popular than other channels, 99% of text messages are opened and read within the first 90 seconds of receiving them. In comparison, only a third of emails are opened, and merely 0.07% of Twitter and Facebook posts reach their intended audiences. Text messaging campaigns are subject to compliance with CTIA rules and the TCPA. When running a text messaging campaign, you want to ensure that you consider text messaging-specific rules, written by the Cellular Telephone Industries Association (CTIA), and laws, written by the FCC, specifically pertaining to the Telephone Consumer Protection Act (TCPA). The final step in this text messaging guide is to acquaint yourself with some of the standout features of a good text messaging campaign. Personalization and targeting. One of the best features of a text messaging campaign is the ability to send personalized text messages to your mobile subscribers. Once people subscribe to your mobile list, you can ask them questions to collect personal data and use that information to customize the content that they receive. Addressing your users by their first name, grouping them by location, and informing them of company news and promotions of special interest to them are just a few examples of how companies use this feature. Automated messaging. Another great feature of text messaging campaigns is the ability to create pre-written conversations so that you can interact with your subscribers anytime, anywhere. Use this feature to welcome new subscribers as soon as they opt in, or create a resource locator service to help people find what they’re looking for in real-time. This will also make your life a lot easier as campaign manager because you won’t have to monitor and respond to every incoming text message. Trackable, shortened web link. For companies and organizations who want to direct mobile subscribers to mobile-friendly web pages, some text messaging platforms—such as Upland Mobile Commons—allow you to shorten web links so that both your link and message can fit within the 160-character text message limit. The Mobile Commons platform even creates a unique web link for every user, so you can track exactly who clicked on your link! While becoming a text messaging pro doesn’t happen overnight, it’s not too complicated once you learn the ropes. Knowing who, what, how, and when to message consumers in the United States can be challenging. In this whitepaper, we’ve compiled SMS best practices to help you determine your compliance strategy. Using Twilio, you can build marketing campaigns that are infinitely flexible and instantly responsive, allowing you to create the ideal customer experience for your users. Explore best practices for the use of email and text messaging in your marketing strategy, and discover why omnichannel cloud communication is the ultimate path to marketing success.